How to host a pretty-in-pink princess party. What girl wouldn’t want to be princess for a day? You can turn any special occasion— birthday, bat mitzvah or Quinceañera— into a pretty-in-pink princess party to make your child feel like royalty. Bring on the balloons and banners; it’s time for her majesty’s ballroom bash! Request “the royal attendance” of your guests with invitations made from pink construction paper cut into heart or crown shapes. Place a picture of the princess on the front, outlined in ribbon, puffy paints or stick-on rhinestones, and write the party details on the back of the invitations. For a special touch, include plastic tiaras or other royal enhancements and mail the invitations in small padded boxes. Encourage the girls-in-waiting to come decked out in pink or dressed like their favorite princesses. When children arrive, offer complementary accessories such as costume jewelry, tiaras, wands, boas and silk slippers. Turn the party room into a pink princess parlor. Cascade the doorways with pink crepe paper streamers and cover the walls with giant pink hearts. Let pink balloons fill the room and hang up posters of popular princesses. Add pink candles, flowers, soaps and pillows to further decorate the room. Cover a table with a pink tablecloth and serve food with pink plastic utensils. At the head of the table, set up a chair for the princess that’s covered in velveteen fabric and pillows. Attach balloons and crepe paper for extra embellishment. Make a centerpiece out of a tiara filled with pink flowers. Supplement the majestic scene with lavish games fit for any princess. Here are some ideas to keep the royal court entertained. Buy two pairs of fancy high-heeled shoes at the thrift shop and set up an obstacle course. Divide the girls into two teams and have the first two players put on the high heels. On the word “Go,” tell the kids to race through the course in their stiletto slippers and pass them on to the next players on their teams. Anyone who falls while navigating the course must start again! Let the girls give one other princess makeovers. Provide costume accessories, makeup, body glitter, hair paint and hair ribbons. Apply temporary heart or butterfly tattoos to cheeks and hands for added fun. Let guests decorate their tiaras with rhinestones, feathers and jewels. Hang a large poster of a frog on the wall. Blindfold the girls one at a time, spin them around, and have them place lip-shaped stickers or real lipstick kisses on the frog. The person who “kisses” the frog closest to its lips gets a cute stuffed frog that may one day turn into a prince. Lead the girls in making beaded necklaces, bracelets and rings. Supply the materials, arrange a worktable and allow guests to design whatever they want. You can buy inexpensive beading materials from party stores, craft stores or online. Be sure to include some pink heart-shaped beads. Encourage everyone to create a scrapbook page for the princess of honor to keep as a memento. Supply decorative paper, alphabet letters, stampers, stickers and other adornments. 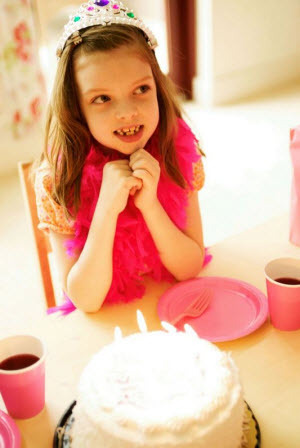 If you want your little princess to add to the scrapbook herself, have guests write titles for their pages, such as, “My Birthday Party,” “The Boys I Like,” “Best Friends Forever,” “My Plans and Dreams,” “What’s Up At School” and “Awesome Vacation.” You may want to assign titles to guests to ensure no repeats. Leave space for comments and photos. Serve fun foods that princesses like such as pizza, hamburgers, salads, chips and dips. Or make it a “royal high tea” and serve herbal teas, dainty sandwiches and pink cookies. For sweet treats, think pink with pink lemonade, pink-tinted bread for sandwiches, strawberries dipped in white chocolate tinted pink and a cake with pink icing decorated with hearts. Bake a bowl-shaped cake, invert it, stick a princess doll in the middle, and frost the bodice and cake to complete the ballroom dress of this beautiful fairy princess cake. Local bakeries and caterers should be able to support your efforts in carrying out the royal theme in other edible ways. Send guests home with heart suckers, pink or red helium-filled balloons, red-foiled chocolate roses, pink Beanie Babies, princess dolls, costume jewelry, tiaras, wands or other princess accessories.